Discussion in 'Announcements' started by evolvegames, Jan 27, 2018. 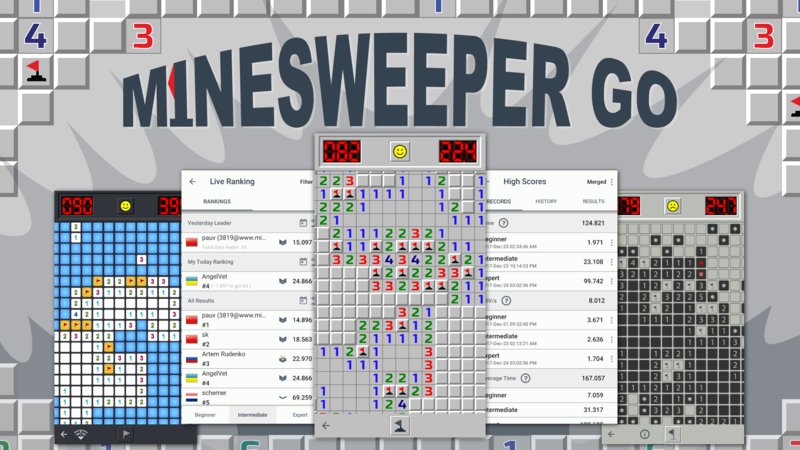 After six months of initial beta release Minesweeper GO has came a long way and at last released to public. I am very grateful to all of you for support and testing. Minesweeper is a challenging logic puzzle, to win you need carefully demine minefield without detonating any of the land mines. Game controls is highly optimized for touch screens. You will get best minesweeper experience on mobile devices comparable to old school minesweeper for Windows. Minesweeper GO update (v1.0.28) is ready! Added Leaders tab on the Live Ranking screen. Minesweeper GO update (v1.0.30) is ready! Minesweeper GO update (v1.0.34) is ready! Magic Wand of Luck. Depending on the state of target square after magic wand is charged appropriate action will be applied: flag will be set if there is a mine or square will be uncovered if it is safe. Smart Hints. Smart hint shows you tile configurations with safe squares that can be uncovered given the current state of the board. They not only indicate safe squares but also explain why they are safe. The mechanism of generating hints doesn't have access to yet uncovered squares. It only knows as much as a player knows. Minesweeper GO update (v1.0.47) is ready! Minesweeper GO update (v1.0.54) is ready! Since last post a lot of things has been added, changed and improved. Most important Minesweeper GO now is available on App Store!